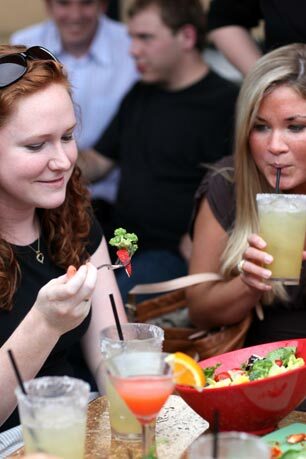 Buzz: Sizzlin’ Summer Patio Party at Gullifty’s Gaarden! All are welcome to enjoy complimentary food—and tons of fun—at AML’s summer patio party at Gullifty’s on Wednesday July 20th from 5pm to 8pm. AML turns up the heat with its very fun Sizzlin’ Summer Patio Party outside on Gullifty’s Gaarden on Wednesday, July 20th from 5 p.m. to 8 p.m.
It’s the perfect chance to kick back midweek and enjoy free food from the great folks at Rosemont’s Gullifty’s. There is no cover charge—just show up in casual dress—and be ready to connect with dozens of great local folks and fellow AroundMainLine.com Facebook fans and Twitter followers. Gullifty’s is a Main Line staple and their popular Gaarden space is one of the hottest outdoor dining spots in the burbs! All are welcome to our Patio Party—guys and gals—21 and over and you do not have to RSVP to attend. We do, however, appreciate RSVPS as they assist AML and Gullifty’s in planning the event to the best of our ability. Click here to RSVP to the Sizzlin’ Summer Patio Party on AroundMainLine.com’s Facebook page. Their website, gulliftys.com, is currently under construction. « Buzz: Mondays Without Meat Arrives at Local Restaurants!